We moved in March 2019! Located across from Kaiser Hospital on Dale Rd. Dr. Tammy Wu and I performing surgery in Modesto, CA. We're a wife and husband surgery team providing world class care. 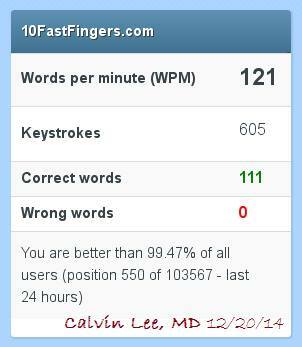 Welcome to my home-made website, written in a casual style by me (Calvin Lee, MD). 2019: We will be moving our Modesto Plastic Surgery practice to Dale Road in Modesto in 2019, stay tuned for details. It will be across the street from Kaiser. December 2018: We added Nicole Kelly, RN as Aesthetic Nurse to our Surgical Artistry team. We will also be adding lasers to our practice - stay tuned! 2018: Voted best acupuncturist, medispa and plastic surgery for Contentment Health Magazine (5th year in a row). 2018: Given top award for REAL SELF's top 25 most loved injector award in the USA. 4 of those top 25 are in California. 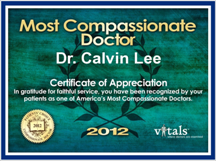 Dr. Lee is proud to be a part. January 2018: Top 500 level status maintained at Allergan for Botox, Juvederm, Kybella, etc. January 2017: Top 500 level status achieved at Allergan for Botox, Juvederm, etc. This based on volume of product purchased. 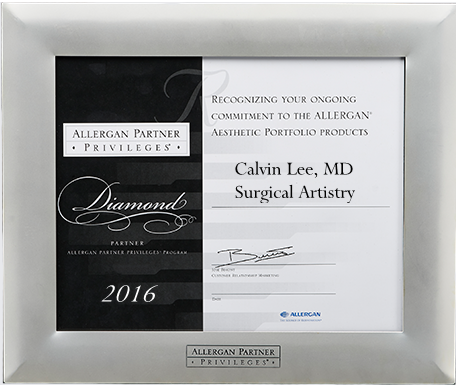 January 2016: Diamond level status achieved at Allergan for Botox, Juvederm, etc. This based on volume of product purchased. 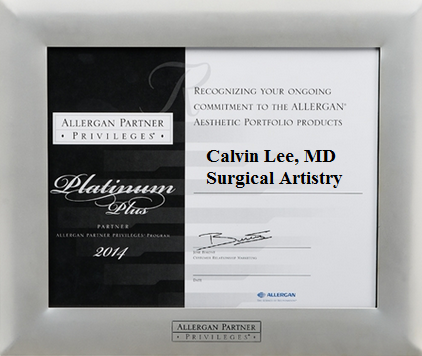 January 2015: Platinum Plus level status achieved at Allergan for Botox, Juvederm, etc. This based on volume of product purchased. January 2014: Platinum level status achieved at Allergan for Botox, Juvederm, etc. This based on volume of product purchased. More information regarding Brilliant Distinctions = Botox Discounts! "My surgical priorities are BOTOX, dermal fillers, and acupuncture"
Surgical Artistry was voted best Cosmetic surgeon 2014, 2015, 2016, 2017, and 2018 by readers of Contentment Health. 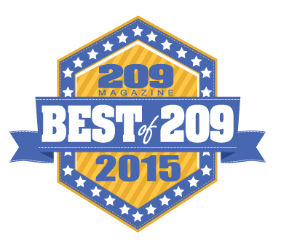 Voted best Acupuncturist in 2015 & 2016 by readers of 209 Magazine. I see Botox as an extension of Acupuncture. Welcome to my Botox web page. I made it myself, and I hope you like it. I made this Botox web page in pieces and parts - during free time when patients were late or "no-shows." I hope this piece-meal creation of this website doesn't become too confusing. This Botox web page is a work in progress and will gradually get longer and longer. The awards above are generous. 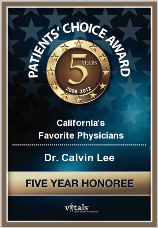 I'm still not entirely sure how I got them, but they are fun to have and I'm thankful for the patients who have voted/reviewed/helped me obtain those awards from Vitals.com. These 8 guiding principles embody how we would want to be treated if we were surgical patients. 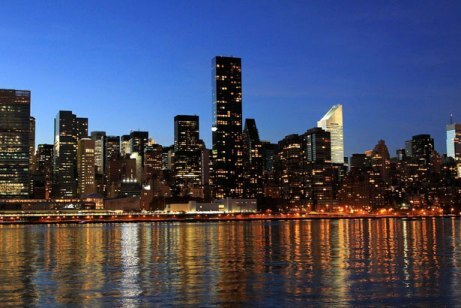 I was born in New York City, and went to school in the suburbs. I graduated top of my class in high school. This led to my acceptances to all the universities I've applied to which included Harvard, Stanford, and Brown Universities. I chose Ivy League Brown University, and there, I met my wife, Dr. Tammy Wu - Plastic Surgeon. We were both students at the time. We continued together onto medical school at Brown University, and Dr. Tammy Wu graduated top of her Ivy League medical school class. Turning down a job offer in San Diego, I found a wonderful career in Trauma/General surgery in Modesto, California instead. Modesto has a scarcity of medical specialists and I felt like I was very needed, appreciated, and welcomed. This was a very fulfilling feeling for me as a medical provider. We decided to call Modesto and Central Valley California our home. 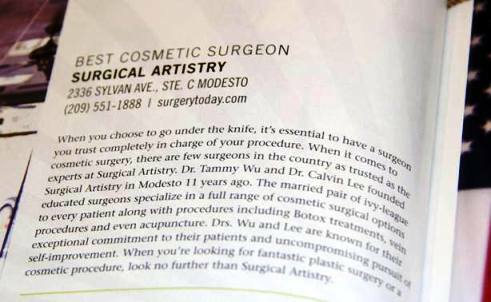 We eventually established Surgical Artistry combining my work with Dr. Tammy Wu, Modesto Plastic Surgeon. We love the opportunities and challenges of Modesto, and we're proud of having contributed to the beginnings of the Modesto Symphony Pops Series, the Gallo Center for the Arts, the State Theater digital projector purchase, and the Surgical Artistry Modesto Marathon. We have been in Modesto, CA since 2003. I had a few educational flings at Harvard and Stanford, but that would take up more valuable space, so I'll leave those minor details out for now. I am a board certified general surgeon. For me board certification and having a license to practice medicine are the minimum requirements for myself - I have much higher expectations for my own education than the standards set by others. It is very important to me as a surgeon is to maintain a high level of knowledge. In addition to learning from others who have pioneered in medicine, I have found that I learn a great deal from my patients, and I value them as my teachers in my growth as a doctor. I look forward to listening to my patients. A Harvard admissions officer once said to me that education is what you personally make of it. I've taken that advice to heart. I even used that advice to make the decision to turn down Harvard's generous admissions offer to enroll at Brown. In the art of Botox and dermal filler injections, I need a detailed eye. I fully believe that My mind cannot see what I do not know; thus I strive to learn more every day. Knowledge of anatomy, complications, and experiences of other doctors/scientists allow me to be a more confident, safer, and more effective surgeon. Gaining new plastic surgery knowledge in San Diego, CA. Botox continuing medical education is important to me. teaching assistant for Anatomy at Brown University Medical School. I have clinically worked with and studied amyotrophic lateral sclerosis, myasthenia gravis, and Lambert-Eaton syndrome - these are neurological problems which may contraindicate the safe use of Cosmetic Botox. I have done several years of neuroscience research and participated on publications in the field. Botox is a biologic medication which interacts with neurons and muscles via the acetylcholine receptor. I am very open when discussing my limitations and abilities. I would like to think of all my patients as my friends. Friends should be honest to each other. Plus, I welcome all sorts of questions. A common question is "Where do you get your Botox?" There should only be one source of Botox in the United States. And that's directly from Allergan, headquartered in Irvine, California. Unfortunately, I have heard that there are other sources of Botox. This is most likely due to the expensive nature of Botox. 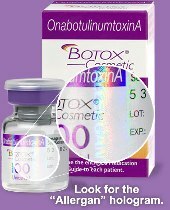 For fun, I have kept most of my bottles of Botox and they all have the Allergan Hologram. I value genuine Botox from Allergan, and I value the rapid shipment methods on dry ice directly from the company (to prevent loss of potency). I know that my results will be consistent and predictable with genuine Botox. My patients deserve the best products and the best shipping protocols. I keep track of many measures so that I can improve upon them. I have been injecting Botox since 2006 and I have been working with needles in a surgical capacity for over 15 years. 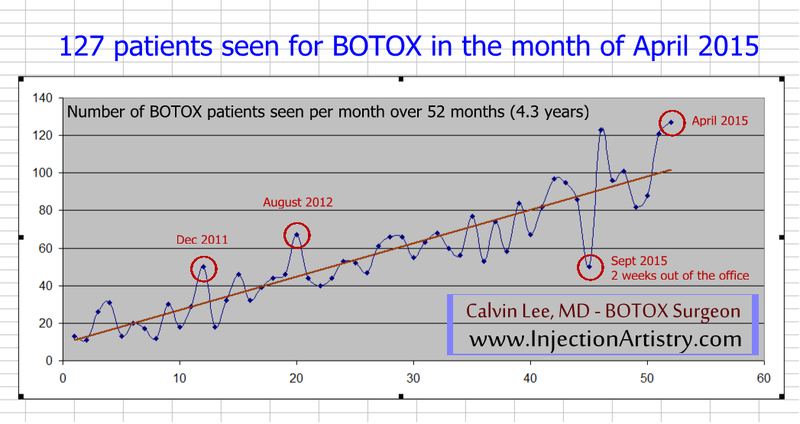 I have been tracking my experience with Botox on a monthly basis. My practice is growing and an example of my recent volume: For the month of May 2014, I have tracked 82 patients who have seen me for Botox. The actual number is higher than 82, but these are 82 patients who have enrolled in a Botox "frequent flyer" program. Back in 2006, we didn't have the BD program available, thus there was no exact data going back that far regarding the number of patients enrolled. This program is not run by us - it is run by Allergan, the makers of Botox Cosmetic. Update: March 2018, I was visited by 246 Botox patients for that month. If you're interested in more detailed statistics of my Botox practice: Visit My 2013 Botox Experience - Year in Review. It shows that there were 724 separate Botox visits to me in that year. Update: 2014 Botox statistics reveals 1013 separate Botox visits to me. 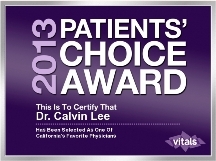 Here's a fun Botox stat: 691 different patients in the Modesto area have come to my office over the past 41 months. And they have visited me 1864 times for Botox according to the Brilliant Distinctions Program. This fun Botox fact was generated on 6/8/14. This is 3.4 years of data - since we started using Brilliant Distinctions. I have been injecting Botox since 2006 - but data was unavailable back that far. Since I value quality over quantity, I will most likely never be the busiest practice in the world. There's limited time in a day, and I don't like cramming more and more patients in because quality would sometimes suffer. But Botox is a high priority in my practice and I consider it a surgical procedure. In fact, it is my top surgical procedure in terms of priority and volume. Botox is a priority in my practice. the Botox-Brilliant Distinctions program. I had used BD to determine the number of monthly visits. For the month of March, 2018, I was visited by 246 patients for Botox. For the month of October, 2014, I was fortunate to be able to see 123 Modesto Botox Patients. In July, 2014, I had a few days off for a medical related trip to Los angeles. I had been visited by 95 Botox Patients who are members of Brilliant Distinctions. 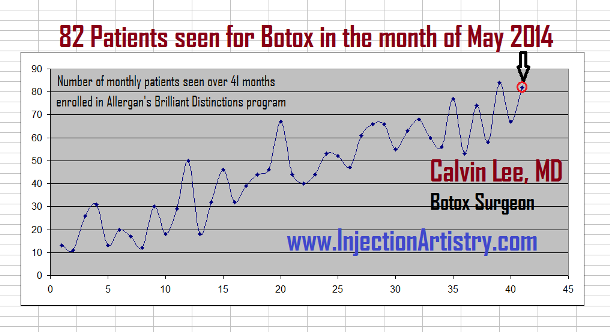 For the month of June, 2014, I had been visited by 97 patients for Brilliant Distinctions Botox. Thankfully, the numbers continue to increase or stay at a high level. Half year (January to June 2014) Botox usage: 15,803 Units of Botox. 218 Syringes of dermal fillers (Juvederm, Belotero, Radiesse). We counted for the month of April 2015, we saw 127 Botox Patients. We used 4638 units of Botox. And Dr. Lee injected 73 syringes of filler. 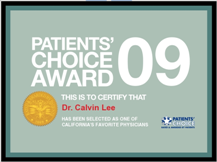 Another monthly snapshot: March 2016, Dr. Lee saw 171 Botox Patients. 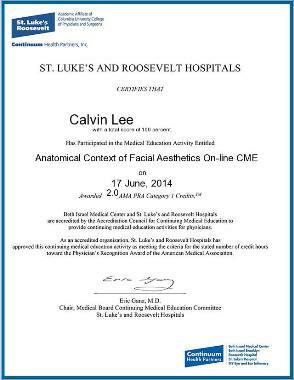 Dr. Lee used 6073 units of Botox. And Dr. Lee injected 104 syringes of filler. Regardless quality is always better than quantity. But it is nice to know that Dr. Lee's Botox numbers are still growing. Thank you for trusting me with your Botox results. 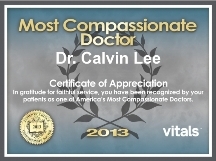 I want my patients to obtain a great value out of their visit with me. Price wars sometimes erodes the quality that I can offer. Thus, I've come to the conclusion that I probably can't win price wars, but I will try to win based on quality and value. I will work hard to earn your trust. And in return I will share my knowledge and experience as a surgeon. I will work hard to keep the prices at a great value for high quality care. In fact, I value planning skills above dexterity skills. One of my surgery program directors once said to me, "we can teach you to cut in 2 years, but it takes 5 years or more to learn when NOT to cut." What he meant was that the ability to plan a surgery is much more complex than the motions needed to complete the procedure. Taking that advice to heart - I take planning seriously - especially for minimally invasive facial rejuvenation (Botox, Juvederm, Radiesse, Peels, DermaPen, etc.). At Surgical Artistry, you have the support of two surgeons. My background is in trauma/general surgery, and Dr. Tammy Wu's background is in plastic and reconstructive surgery. We discuss safety all the time, but when unexpected urgent medical problems arise, we are both available. 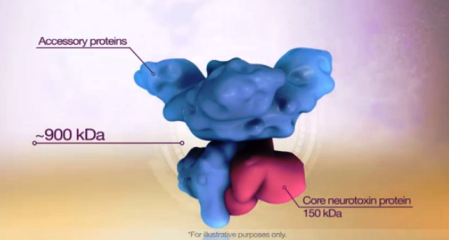 The human body is certainly very complex. And each year, I grow to appreciate the complexities of Botox and dermal filler injections. There is much to respect in terms of patient safety. I've personally made impulse purchases which I've later wished I had spent more time researching. It's my hope that I prevent my own patients from making impulse buys. We need to spend extra time to educate and discuss. Furthermore, I rarely have any "specials" on procedures such as Botox injections and dermal filler implants (Juvederm, Belotero, Radiesse, etc). I feel that every day should be special and there is no need to rush into a decision just because the "special" is about to expire. I like to keep my prices steady and at a good value - always. I encourage patients to do one thing at a time and to go home and think about the procedures. No need to rush. And there shouldn't be any pressure. My staff counted once, and I use up about 500 needles per day. I use needles for acupuncture, vein injections, Botox, Juvederm, Belotero, Radiesse and DermaPen. Doing surgery with needles is what I do at Surgical Artistry. I also love using a cannula for dermal filler injections. So if you need medical procedures which involves needles, please consider me. I try to also pick the needles that hurt less. I wrote more about this at the link: Does BOTOX Hurt? Both of these pictures are my patients who have given me permission to use their photos. Thank you. 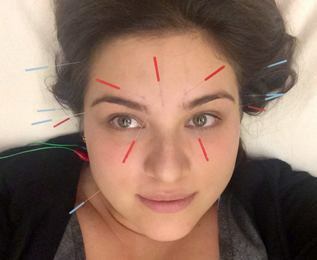 Acupuncture for migraine headaches & for facial rejuvenation - very small needles on the forehead. For my violin music, I understand the creation of art which appeals to one’s favorable emotions. This artistry is the same for the subtle changes that I need to make when injecting Botox and fillers (Restylane, Radiesse, Perlane, Juvederm, Belotero, etc). I am a surgeon and an instrumental musician – these are two things which improve my dexterity every day. Having precision is a high priority in my life. I have had the honor of playing violin at a relatively high level. I was the concertmaster (lead violinist) of the Brown University Orchestra and an orchestra at Harvard and winner of several concerto competitions. I have also had the privilege of playing violin at Carnegie Hall in New York City, twice. I am currently teaching myself piano as a hobby to keep my finger dexterity at a high level. 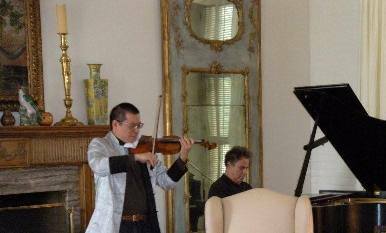 Violin - Meditation by J. Massenet from Thais, with Dr. Tammy Wu on piano, October 2014. Violin (Tchaikovsky Violin Concerto), at Brown University - one of my favorite "videos." Violin (Schindler's List performed in Taiwan as guest Concert Master), at the National Concert Hall, Taipei. Piano (Chopin Etude Opus 10, Number 1), at home in Modesto, CA. Piano (3 pieces by Chopin - Minute Waltz, Nocturne, L'Adieu Waltz) - added July 2014. 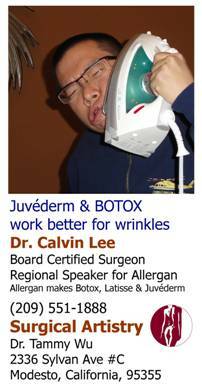 Dr. Calvin Lee injecting Botox. Picture used with permission. Thank you! I also value some typing skills. I think at least 50% of creating a great result is based on understanding the patient’s vision and goals, and then also communicating expectations and trade-offs. The final result is the result of teamwork with me, my office and my patient. This type of communicative teamwork requires time and patience to achieve the desired result. Teaching is also a form of communication. I enjoy teaching others. UC Davis gave me a teaching award for teaching medical residents. And I have also been a physician speaker for Allergan (the makers of Botox, Juvederm, and Latisse). Why? Because my plastic surgeon wife will kill me otherwise. Well, kidding aside, I am dedicated to great results for all the modalities I offer at Surgical Artistry: Acupuncture, Botox, Dermal Fillers, and Veins. Great results and happy patients fuel my enthusiasm and purpose on this planet. Feel free to read and write me a review on Yelp. I was in the Modesto Bee for meeting up with two very special young brothers who wanted to become surgeons and who also happened to play violin! 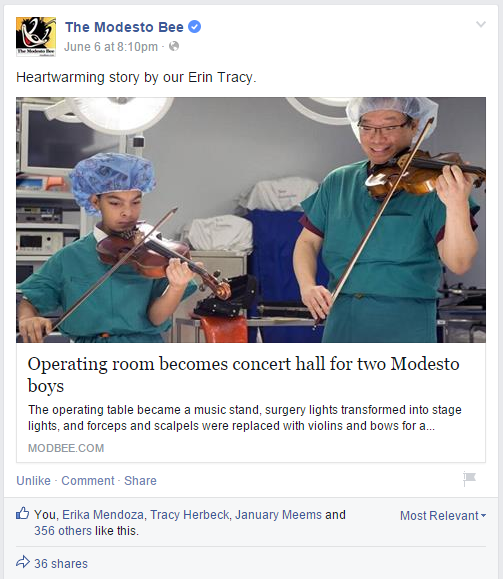 My Blog about the Surgeon-Violin event at Doctors Medical Center, Modesto. Here's the link to the Modesto Bee FaceBook posting. 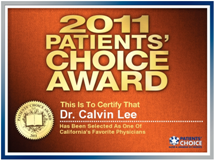 November 2014, we were given the award for Best Cosmetic Surgeon in Stanislaus County by Contentment Health Magazine. I made a list of where to get Botox in Modesto, California. Please consider choosing me for your Botox. But I do have a lot of respect for the other Botox injectors in Modesto. Please visit my Modesto Botox Blog for some of my latest ramblings on about Botox and Cosmetic injections. A recent blog is: "Botox in Modesto - Where to get injections" - there's actually about 30 different Botox injectors in Modesto, CA. I list them in that blog - to the best of what I know. Valeant (the makers of Obagi, etc) is attempting to buy up shares of Allergan (the makers of Botox, Juvederm, and Latisse). RealSelf Questions and Answers - this updates on it's own with the latest questions. Botox doesn't work as well anymore - what to do? - Think Zinc. Botox for Slimming the Jaw - for me, it takes a series of injections. Botox for Changing Eye Size - yes, it can be done. How to dissolve Belotero? - carefully with Hylenex or other products. Voluma disappeared after a month? - not usually the case. Bulging vein after Voluma injections - could be multiple issues. These links might help show the type of Botox practice which I have. 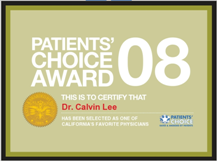 Modesto Botox Brilliant Distinctions Statistics - this is the total number of patients enrolled. Includes Latisse patients. How I make time for Botox patients in my Modesto office time which includes veins, acupuncture - pie chart. 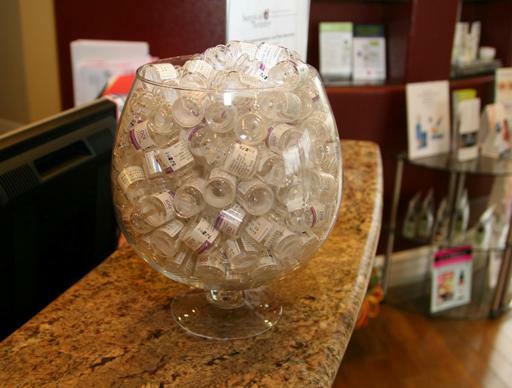 Number of Botox Bottles purchased in our Modesto practice in 2014 - it's a nice number. 32 full time job-years to become a Modesto Botox Surgeon - an interesting way of calculating, based on 40 hour work week. 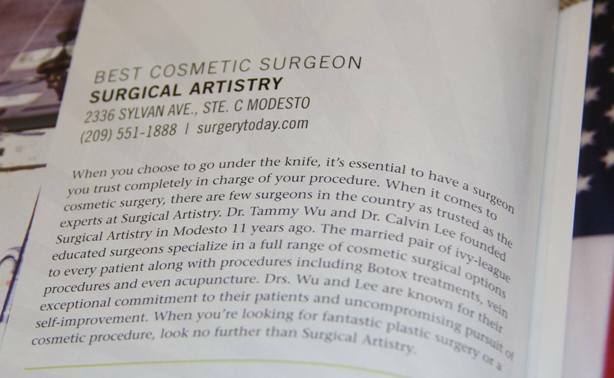 Quick Blurb about the Modesto Botox Surgeon - ie. Me. This could be a 1 minute narrative. But for the most part, just come to the office for a FREE Botox consultation with me and I'll be sure to answer all your questions. 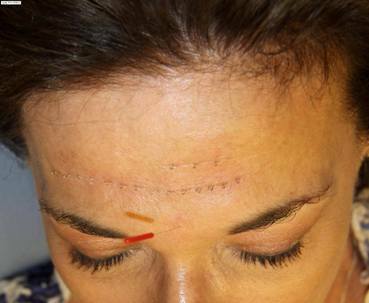 Does being a surgeon & acupuncturist help with Botox injections? Top 6 non-surgical procedures at our office. Botox and filler consultations with Dr. Lee is currently free. Your first consultation with Dr. Lee can also be a Botox injection session. If you are planning on getting filler, please make a mention of this when scheduling and we will add additional time. How to reduce bruising after Botox? Botox specials & discounts - mainly it's Brilliant Distinctions. 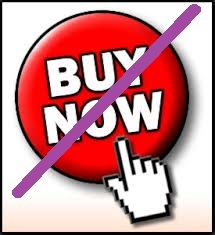 In order to avoid pressuring patients, we don't have many specials. Botox for men - how's it different than Botox for women? We prepare for Botox Emergencies and Filler Emergencies so that we are prepared and safe. Our Botox Statistics - we share our Botox Info with other top Botox Injectors. 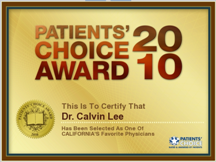 Visit Dr. Calvin Lee's Botox Blog - it's more like Botox Babble. Have fun! Chopin Etudes as dexterity practice for Botox injections. The difference between Medical Botox and Cosmetic Botox. Trend of Botox visits to our Modesto office (updated Nov, 2014). Botox in a Box - Delivery. How Botox works: Explained with WiFi analogy. A Unique Belotero injection technique. Serial Puncture. Lowest price Botox? Is it worth it? Juvederm Voluma for lips? A question on got on the phone. Other procedures besides Botox? Well-roundedness! Please ask more questions by calling my office (209) 551-1888. Born in New York City, attended high school in the suburbs of the city. Graduate of Brown University Medical School and University. Undergraduate degree in Neuroscience. Married Dr. Tammy Wu (Plastic Surgeon) who graduated #1 in her class at Brown University Medical School (someone gets that title). Was accepted to just about every Ivy League for College. Turned down Harvard, Stanford, and many Ivy League schools to attend Brown University (which is also an Ivy League School - had to pick one). Eventually went back to Stanford and received acupuncture training. 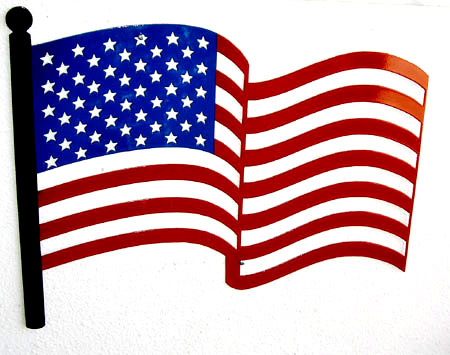 Works on the District Counsel for Cooperative of American Physicians, based in Los Angeles. Played twice at Carnegie Hall on violin. Won the Brown University concerto competition twice. Soloed with the Tchaikovsky Violin Concerto. Listen to an excerpt of this concert (live recording) here. Was concertmaster at Harvard over the summer. First and currently only physician to have made it onto the YouTube Symphony. Dr. Lee played violin in the orchestra as one of the few non-professional musicians in the orchestra. The orchestra was conducted by Michael Tilson Thomas. Assistant professor for UC Davis affiliated medical residency program training young doctors. Received a teaching award for this in 2006. Selected as a regional (northern/central California) speaker for the Allergan company (makers of Latisse, Juvederm, Botox) - to speak on Latisse. 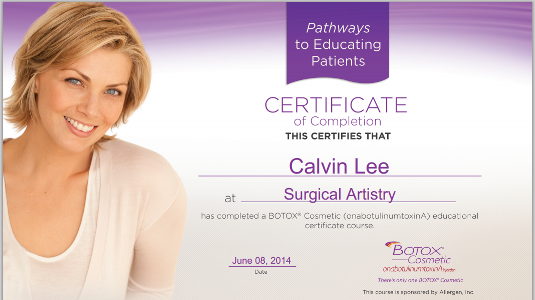 There is slightly more detail about Dr. Calvin Lee at the bottom of this slightly outdated Botox webpage. There's a whole bunch, but here are some highlights. This container wasn't big enough for all the Botox vials. Juvederm & Belotero injections for: folds on the face, hand rejuvenation - including plumping, and vein removal, indented scar filling, nose reshaping, lip augmentation, under the eyes (tear trough), chin/cheek reshaping, lines around the mouth. Some of the procedures listed above are considered to be "off-label" by the FDA. We feel that Botox and Juvederm are appropriate for these indications. Click this link to read more about off-label Botox and Juvederm usages. What is your practice style? Actually the question (or statement) goes something like: You seem too laid back and "friendly" to be a doctor. I guess this is a question because there's some disbelief behind it. I guess this is a compliment?? Not sure though. My style is laid back and friendly. Why not be laid back and friendly to keep our patients smiling. I think people should enjoy their visit and gain knowledge. I see that as my main purpose in our practice. I want our patients to look forward to visiting me (yes, and look forward to getting stuck with needles). I think if I have the potential of "hurting" a patient with a needle, I need to at least somehow make it enjoyable (maybe even with some humor, but definitely by being friendly). I enjoy a good laugh with our patients, and I love it when patients smile. I don't think I'm naturally an intense scary person - perhaps that's what people think of when then think of "doctor" or "surgeon". The primary reason patients see me is to learn about what aesthetic medicine can do for them. Or more specifically, what I know about aesthetic medicine. I have my limits of knowledge too. I strive to learn more every day and I actually learn quite a bit from my patients - from what they know and what they like about the results after trying a procedure. My main job is to impart information - about risks, benefits, and what to realistically expect. I find many patients pushing me to do more, perhaps I'm on the conservative side. But each patient is different. My next most important job is to try to see the results and expectations from the patients viewpoint. I call it "trying to get inside your head" - basically like "wearing your shoes" - but if we're working on fillers and Botox, I'm not usually injecting it into the shoes or feet (although that could be done for excessive sweating). My third most important job then is to perform a great procedure (for example, Acupuncture/Botox is a Jab well done..... um... never mind). There you have my top three priorities with info sharing being the very top priority. The "laid back" part is more about not rushing and not trying to act as "the boss." Rushing isn't good for communication, and really, acting like I always know what's best isn't for real. But I am very intense and uptight about maintaining safety and best results. Why Modesto? Why not some big famous city to live in? The short version of the answer would be: I came to Modesto, CA to be a broad based trauma general surgeon, and at the time, the large Kaiser hospital wasn't here either and the amount of work to be done here as a trauma and general surgeon was huge! Based on data, I was in the upper 90th percentile for the volume of work that I did in Modesto as compared to other surgeons in the USA. This was exactly what I had wanted at that time! My wife, Dr. Tammy Wu, Plastic Surgeon, followed me here, originally she was going to do a fellowship in microsurgery, but then plans got changed, so she came to Modesto with me and found that she liked Modesto and her practice flourished here. Thus we decided that Modesto was a great place to practice medicine. In 2006, I stopped taking trauma call for the hospitals and co-founded Surgical Artistry with Dr. Tammy Wu. 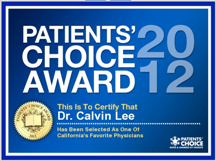 I really enjoy living and working in Modesto and having patients from Modesto and surrounding areas (ie. Turlock, Riverbank, Oakdale, Ripon, Del Rio, Escalon, Salida, Ceres, Stockton). I look forward to making Modesto great! 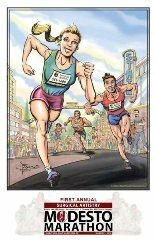 My wife (Dr. Tammy Wu) and I (as Surgical Artistry) have been founding sponsors/supporters of the Gallo Center for the Arts, Modesto Symphony Pops Series, and the Surgical Artistry Modesto Marathon. I get this question a lot (from my friends, from my patients, and sometimes from my family). I think it's a compliment meaning something like "you're too big for this smaller town, you should be somewhere bigger." Initially, I had dreams of going to a small town in Kansas and being a super doc in a very small town. I wanted to go to a place where there weren't many doctors - thus I could be very broad based (have many expertise and be useful). But I had to compromise because my wife has family in Los Angeles, California, and her family wanted her to be closer than Kansas. I settled for finding a "small" town in California. I initially thought I would try Reedley, CA and Selma, CA (near Fresno). But during my interview with the hospital there, I set a building on fire (if you want to know more about this - ask me!). I saw this as a bad omen, so I searched further away from Los Angeles and found Modesto! I started work with the McHenry Medical Group as a trauma general surgeon. My wife (Dr. Tammy Wu - Plastic Surgeon) found a great job working at Sutter Gould. In 2006 we decided to join forces and create Surgical Artistry. At that time, I decided to focus my practice on needle related healing arts: Acupuncture, Vein Sclerotherapy, Botox and Fillers. I see injections as an extension of my surgical skills and duties. And one more reason for "why Modesto, CA." I love a challenge to prove myself - such as when I didn't go to Harvard. I wouldn't be able to say "better than Harvard," if I had gone to Harvard (I don't know if I ever lived up to this challenge). Harvard, of course, is a great school, and perhaps one day I'll find a reason to go, but it hasn't been my style to go with what is considered the "top". I enjoy the climb to the top, and can't do the climb if you already start there. The challenge here in Modesto is to say we are better than Bay Area or better than Beverly Hills. I only get that chance if I go to a different town - such as Modesto (or somewhere in Kansas). Perhaps we will one day be known as better than Beverly Hills or Bay Area. It's a challenge I hope to continue to achieve every day. I do have many friends who are plastic surgeons in Beverly Hills and other big cities (ie. San Francisco) - please visit them if you do live in those areas (I went to school and trained with them while at Brown University and other wonderful medical training institutions). In the end, it is very difficult to compare practices, but we can always try to achieve improvement. Do you still do surgeries? Yes, I do some. I have recently done some hernias, breast cancer, and gallbladder operations. However, I no longer accept medical insurances; thus making it somewhat difficult to coordinate these operations with the hospital. Some of the hernia operations that I have done were in conjunction with my wife's cases (such as tummy tuck with umbilical hernia repair). I assist often in plastic surgeries, with my wife (Dr. Tammy Wu) as the lead surgeon. And I also assist regularly with a surgical pain specialist doctor who has a relatively large case-load with CNS pain pumps and nerve stimulators. The surgical assisting keeps me in the operating room. I do enjoy surgeries. However, to be good at acupuncture, botox, fillers, and veins, I basically had to give up 99% of my previous operating life. This switchover was a conscious decision in 2006. I used to log over 800-1000 surgical cases per year in general surgery which included some trauma and vascular surgeries. I believe that the average number of surgeries per year per surgeon across the US is a much lower number. I still maintain my board certification in general surgery. I am glad I have these skills and can bring them to my present practice with acupuncture, botox, fillers, and veins. How do you fit in violin with your aesthetic medicine life? What are some other websites that you have made? Actually there are really too many to list. I have made over 1000 web pages. I don't play golf like the other doctors - I just make web pages. If you don't show up for your appointment, I'll be sitting in my office waiting, and sometimes, this gives me the inspiration to make yet another web page. I have made the webpage for the first Breast Cancer Support group on the internet. My web pages have been mentioned in national magazines such as US News and World reports, and I believe I have made one of the first plastic surgery web pages ever in the US back in 1995-96. 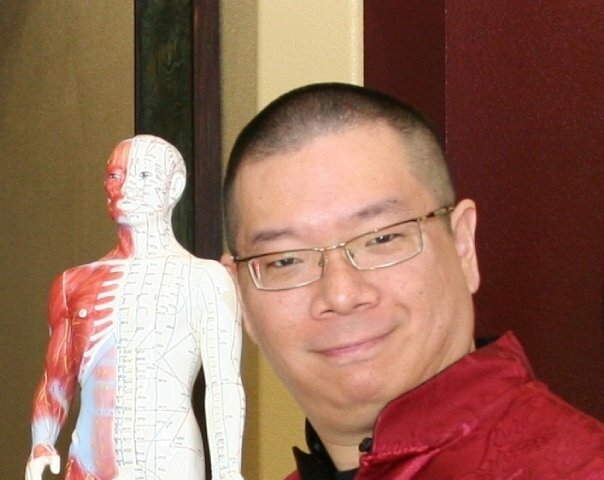 Please search Google or Yahoo for Modesto Plastic Surgery, Modesto Tummy Tuck, Modesto Acupuncture. Modesto Vein procedures and you may find some of my other websites. 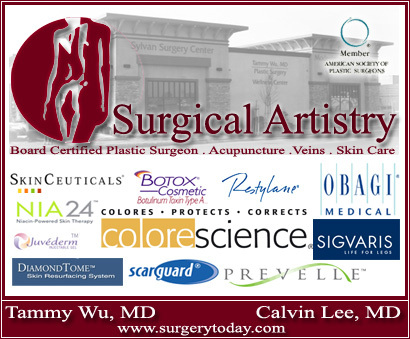 Dr. Wu and Dr. Lee can be contacted via their office: Surgical Artistry. Follow us for future Botox / Juvederm injection announcements! Disclaimer: Do NOT iron your face. It will cause damages. The picture above was done with the iron in the OFF position and was NOT plugged in. You don't know how much trouble I got into with Dr. Wu (the wife) for getting "oils from my face on that iron." Therefore, don't get in trouble at home either. LATISSE®, BOTOX® and JUVÉDERM® are registered trademarks of Allergan, Inc.